The ‘genuine’ historical novel and the ‘genuine’ scottian epic poem in ‘modern times’. For over a century, it has been taken for granted that David Jacob van Lennep’s Discourse on the significance of Holland’s soil and antiquities for sentiment and imagination (1827) inaugurated the historical novel as a specific literary genre in the Netherlands. The historical epic is supposed to have benefited similarly. In this article I inquire whether the conventional separation between historical novels and epics before and after 1827 does in fact rest on objective and tangible characteristics of these works. If we were to examine the entire corpus of historicising literature between 1780 and 1940, would we or would we not encounter a continuous developmental line? A preliminary investigation of some specific cases suggests that, as a genre, the historical epic has vanished completely, whereas the historical novel remained as vital as before up to World War II. Its objective, however, was no longer the re-enactment of the past but the dissolution of the separation between past and present. Action on the pitch. 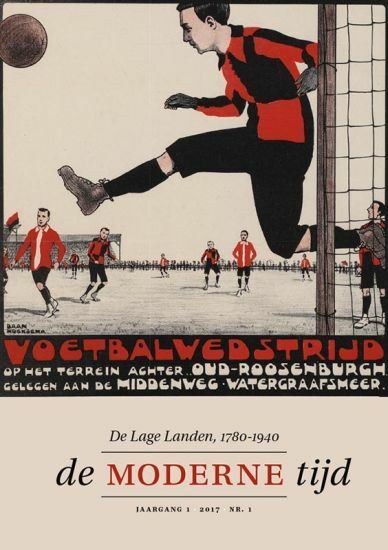 A visual approach to nineteenth century football history in The Netherlands. This article illustrates the ‘visual turn’ approach to sports history in an analysis of traditionally under-researched material from the late nineteenth century. Focusing on football (‘soccer’) action photography, we argue that interpreting this visual material contributes significantly to the exploration and interpretation of the broader social and cultural context within which sports were practised and the visual material was produced. Regarding the latter, the photographer’s challenge was to capture the movement inherent in the practice of sports generally and of football specifically. Our analysis explains the time at which these pictures first appear as a consequence of developing possibilities and skills in ongoing photographic experimentation. This is illustrated by a case study of a football action photograph from the archives of the Noorthey Institute for boys in Voorschoten, dating from 1895-1897. There, conducting sports was seen as a way of enhancing the students’ physical and mental strengths, including improved study performance. It took place in an atmosphere of camaraderie among teachers and students, the latter acting as supervisors and teammates at the same time. Beyond the texts, the photographs visualize what this educational approach entailed in actual practice. Writing for the present or writing for the future? The war literature of Abraham Hans. Even though his name may mean little to readers today, the work of Abraham Hans (1882-1939) was hugely popular with the Flemish public in the interwar period. This article studies his neglected World War I novels which, like most of the Flemish war literature, have received little critical attention. On the one hand, it explores the ideas that inform Hans’ representation of the war. On the other, it argues that his work did play a role as a medium of cultural memory in the interwar period. Around the volcano. La Muette de Portici between creation in Paris and reception in the Northern Netherlands. Since its première in 1828, La Muette de Portici has been one of the most popular grands opéras performed in Dutch theatres in the nineteenth century, despite its reputation of having incited the Belgian Revolt of 1830. Based on a wide range of primary sources, this article analyses how, in the initial process of cultural transfer from Paris to the Netherlands, the opera with its ambivalent political tenor was staged and received differently in three theatres in Amsterdam and The Hague. In the aftermath of the Belgian Revolt, authorities, artists, press critics and audiences subsequently problematized, rehabilitated and enriched the opera with new meanings. After having been feared and condemned, ‘Amour sacré de la Patrie’ again became a favorite aria to enthusiastically respond to.